A Wirz-Ridolfi. Comparison Between Intravenous And Various Types Of Transcutaneous Laser Blood Irradiation. The Internet Journal of Laserneedle Medicine. 2013 Volume 3 Number 1. The influence of four different ways of laser blood irradiation on the human energetic field is compared, based on 100 measurements. Intravenous laser blood irradiation (20 minutes, red laser), transcutaneous irradiation in the popliteal fossa (20 and 30 minutes, infrared light), transmucous irradiation under the tongue (sublingual, 20 minutes monochromatic red light) and transmucous sublingual irradiation (bichromatic red and blue simultaneously, 20 and 30 minutes) are compared. Since 1981, when Russian authors 5 for the first time reported positive effects of laser blood irradiation, intravenous laser therapy is applied in human and veterinary medicine for various indications also in the west 1,6,12,13,14. According to Einstein’s principle of duality, laser radiation appears either as waves or corpuscular radiation (8), depending on the experimental condition. These corpuscles are called photons and are absorbed in the respiratory chain (citrate cycle) in the mitochondrial wall, at different places depending on the color of the laser light applied. Therefore blood irradiation with laser light increases energy production. Also acupuncture treatment with needles, especially using cardinal points, increases the patient’s energy – but only by mobilizing reserve energy (as cardinal points switch on extraordinary meridians). The common denominator of needle- and laser acupuncture are actually the photons: every needle prick destroys a number of cells which start producing photons in their decline, so-called biophotons. However, with laser light genuine additional energy is introduced into the system, but without destroying cells. The effects of laser light can be demonstrated in different ways: by inspection when skin diseases such as neurodermitis disappear 12, by alterations of laboratory findings in humans and animals 12,13,14 by measuring the blood flow ratio with hightech equipment 4, and by assessment of the energetic field with VAS (Vascular Autonomous Signal), polarity filter, and polarityfield meter (see below). Not all patients agree to or are able to have their veins punctured. Not all patients have veins that can be easily punctured. Especially in obese cases both patient and therapist tend to suffer and perspire. Also from the legal point of view not all therapists are allowed to puncture blood vessels, as invasive treatments are reserved for medical personnel. 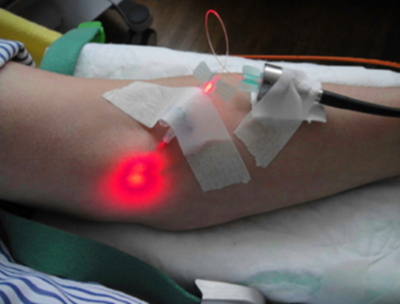 Another advantage of alternatives to intravenous therapy: With transcutaneous or transmucous laser blood irradiation there is absolutely no risk of bleeding or infection. 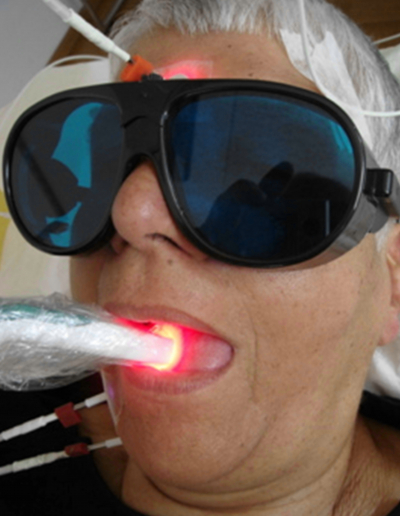 The following methods were investigated: Intravenous laser blood irradiation, transcutaneous laser blood irradiation in the poplitea, and transmucous laser blood irradiation under the tongue. Each method has its specific advantages and disadvantages: the latter two applications have the advantage that the patient does not need to be punctured. The disadvantage of popliteal irradiation is that the patients have to lie face down in order to guarantee a good contact between laser and skin, which leads to dyspnea in obese persons. In sublingual irradiation the applicator must strictly remain underneath the tongue, there is no allowance for moving the tongue around. However in principle any part of the body where large blood vessels lie directly underneath the skin or mucous membrane is suitable for laser blood irradiation. Therefore we have tried to develop methods which allow laser blood irradiation without perforating the skin and have documented the improvement of the energetic field by numerous measurements. In the present study different forms of laser blood irradiation are compared by measuring the extent of the individual electromagnetic field (energetic, or polarity field) in order to find out whether a noninvasive method is possibly equivalent or even superior to intravenous laser blood irradiation. The systems of Weberneedle® and Laserneedle® irradiate the blood in the visible range of the electromagnetic spectrum, whereas the system of Reimers and Janssen works in the infrared A range (904 nm). As mitochondrial absorption occurs primarily in the visible range (400 - 700 nm), one must use longer radiation times with Infrared A lasers a priori to obtain approximately comparable effects. Transcutaneous systems irradiate larger blood volumina than the intravenous technique but must apply considerably more light energy because of tissue absorption and scattering effects in the tissue which cannot be neglected. In all systems continuous wave mode (cw) was used for irradiation. A gauge 22 plastic cannula size 0.9 x 22 mm is inserted in a peripheral vein (mostly cubital, other possibilities: distal forearm, dorsal hand, even ankle region), fixed with adhesive plaster, then the mandrin is removed, a plastic light conducting catheter (lasercath®) is inserted into the cannulated vein and then connected to the glass fiber cable of the laser system. The patient lies prone on her abdomen and the impulse laser probe is applied directly on the skin of the poplitea. In supine position the contact between probe and skin is not guaranteed. 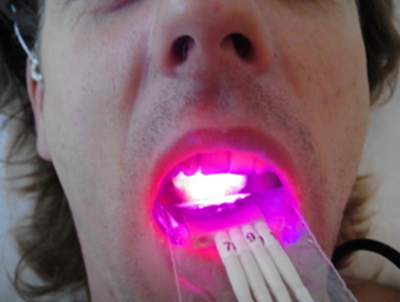 5 glass fiber light conductors are inserted into the sublingual probe of webermedical®. For hygienic reasons a transparent household foil is wrapped tightly around the tip of the probe. Its exact placement underneath the tongue is important, as the blood vessels are located there. The sublingual applicator according to Schikora is equipped with four laserneedle light conductors, 2 of red and 2 of blue color. The applicator is inserted into a hygienic small plastic bag and placed exactly underneath the tongue. 81 persons (31 male, 50 female; aged between 13 and 94 years), all patients of the MEDI-CHINA Center for Traditional Chinese Medicine and Laser Acupuncture, took part in this study. Totally 100 measurements of the individual electromagnetic field (energetic field or polarity field) were taken before and after laser blood irradiation. 19 patients were measured at two different sessions. 10 patients as above for 30 minutes. Therefore the total energy irradiated amounts to 3.6 J with 20 minutes intravenous laser, to 180 J with 20 minutes popliteal laser, to 180 J with 20 minutes monochromatic sublingual laser and to 170 J with 20 minutes bichromatic sublingual laser. Consequently the different transcutaneous methods applied show comparable total energies. With 30 minutes treatment the total energy of irradiation increases to 270 J (popliteal laser) or 258 J (bichromatic sublingual laser). With all transcutaneous methods it is not possible to quantify optical power densities which take effect in the blood vessels, because they are strongly influenced by scattering processes in the tissue which are physically most complex. But for intravenous laser blood irradiation the power density at the end of the optic fiber can be calculated exactly from the diameter of the fiber and the power of the laser. To measure the exact extent of the polarity field (electromagnetic field, energy field) of a patient and its changes, one needs an adjustable measuring rod (e.g. the polarityfield meter according to Wirz/Mathis®), a polarity filter (polaroid foil) and an examiner acquainted with the VAS (vascular autonomous signal), also known as RAC (réflexe auriculo-cardiaque) or Nogier reflex, so called in honor of Paul Nogier, the French discoverer of ear acupuncture. 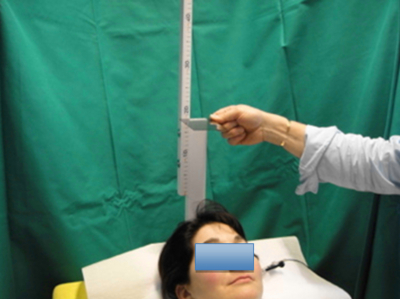 Put the bottom board of the polarityfield meter underneath the pillow; adjust point zero of the measuring rod to the level of the patient’s forehead. Now the examiner holds his polarity filter into the energy field above the forehead of the patient and simultaneously palpates the patient’s pulse. He then moves the filter slowly upwards along the measuring rod until the impact of the patients pulse gets stronger underneath the palpating fingers of the examiner. This reproducible phenomenon is called RAC, VAS or Nogier reflex. At this exact level the extent of the patient’s energy field is read in centimeters and written down. Now the laser is switched on, laser blood irradiation begins. After completion of the individual treating session the procedure is repeated and the second measurement is noted. The difference of the values (in cm) before and after each treatment shows the influence of the various laser applications on the energy field and was recorded for the first time in this present study. Although differences of the various types of laser blood irradiation are small and at the edge of significance (p≤0.05), they are still recognizable. Compared to intravenous laser blood irradiation, popliteal laser irradiation for 20 minutes scored worst with 80 %. But if increased to 30 minutes, remarkable 98 % are reached. However the monochromatic sublingual probe attained only 83 % of the standard. 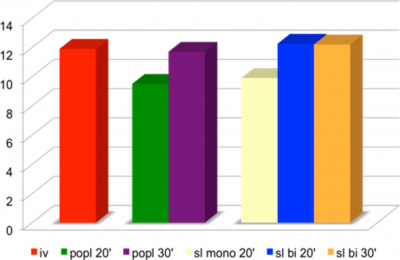 The best score was reached by bichromatic sublingual laser treatment, it exceeds even the result of the intravenous application: 103 % at 20 minutes and 102 % at 30 minutes. Contrary to popliteal irradiation, an increase of treatment time by 10 minutes does not produce a significant change. Fig. 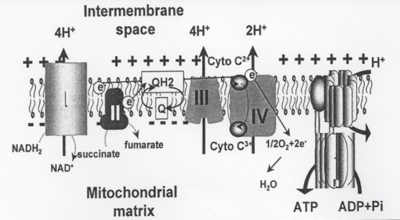 7: Energy production occurs in the mitochondrial respiratory chain and is increased by the photons of laser light. As alternatives to intravenous laser blood irradiation there are transcutaneous popliteal and transmucous sublingual laser blood irradiation available. In the present study, different possibilities are compared regarding their influence on the human energetic field (polarity field). If the improvement of energy by intravenous laser blood irradiation is taken as a reference of 100 %, 20 minutes of popliteal laser shows the worst results at 80 %, while 20 minutes of sublingual bichromatic laser shows the best results with 103 %. Obviously there are possibilities of a non-invasive laser blood irradiation which are - in relation to the chosen parameters - equivalent to the results of intravenous laser blood irradiation. I should like to thank all my colleagues listed in the table of literature for inspiring reading, stimulating conversations and their unrelenting efforts to bring forward laser acupuncture. My special thanks go to Prof. Detlef Schikora of the University of Paderborn for his physical explanations and calculations. 3. Karu T, Kolyakov M: Exact Action Spectra for Cellular responses Relevant to Phototherapy. Photomed Laser Surg; 2005; 23(4): 355-361. 4. Litscher G, Schikora D: New Concepts in experimental acupuncture research – computer controlled laser acupuncture. European Journal for Acupuncture; 2002, Vol.28, No.3: 18-28. 10. Schikora D: Lasernadeln für die Akupunktur. Eine nicht-invasive, optische Akupunkturpunkt-Stimulation. Schweiz Zschr GanzheitsMedizin; 2004, 16: 304-308. 12. Wirz-Ridolfi A: Moderne Laserakupunktur in der täglichen Praxis. Schmerz & Akupunktur; 2007, 2: 91-95.